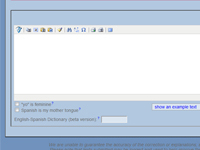 SpanishChecker is a web-based spelling and grammar checker for Spanish as a second language. It will analyze your text, find common spelling errors and grammatical mistakes and provide valuable information about errors. Simply type (or paste) your text into the main window and hit the "Check Text" button. SpanishChecker is free to use; however there is a Pro version available for a small fee which boasts a few more features and removes the advertising from the pages. I love it. I use it for work and school.